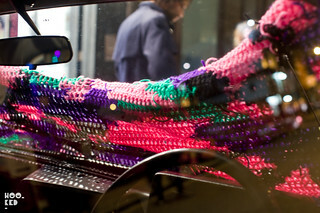 Earlier last month Hookedblog posted about Polish-born, New York based artist Olek, having stumbled across one of the artist's yarn bombed installations on the street (covered here). We were hoping we would be seeing more from the artist on the streets of London and she certainly didn't disappoint. 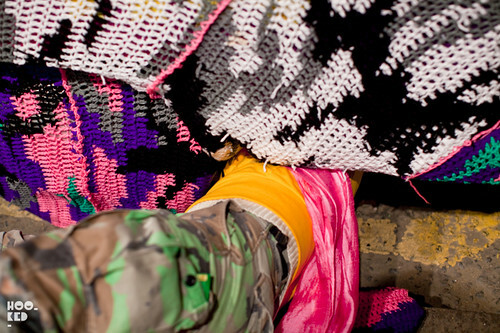 We caught up with Olek over the weekend as she worked on her latest installation outside Tony's Gallery (now closed) on Sclater Street. 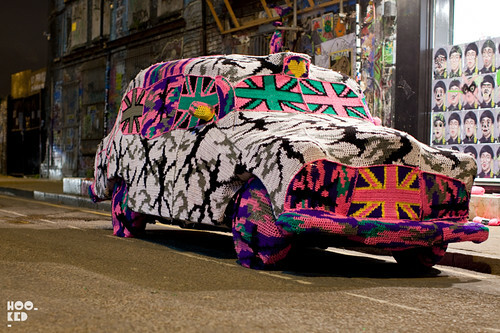 The artist spent two days wrapping an entire London Black Cab, wheels and all in crocheted yarn featuring her signature camouflage print with the addition of some union jack's much to the delight of the passing public. Have a look at our photos below of the finished taxi and should you be in the area go see it in person as the Black Cab will be parked outside Tony's Gallery for the rest of the week. Hi, Im a PROUD yarn bomber, Im wondering if this piece is still assembled and where it is? im an art student and I think it would be amazing to get a first hand look at this beauty! It is a great topic and deserves thanks and follow-up..